It must be hard for Corruan Hill to have such mountains as Croughaun, Minuan, and Slievemore as its neighbours. Prehaps Corruan Hill is somewhat overlooked when deciding on a route in the area of Achill, only 22 members logged as climbed Corraun Hill compared with 94 for Croughaun and 82 for Slievemore. Ok ok I must now put my hand up....as it happens I would easily have overlooked this pretty hill if it was not for the fact I was staying in a quaint little house along its broad base!!!!! With Corraun Hill taunting us from every view in the house it was inevitable we would become better acquainted. Living in Dublin its very unusual, for me anyway, to start a days walking in the hills from the front door, but it was a great feeling to pull the door behind me and walk right past the car! We decided to approach Corruan from the south so off we set up the road past the church and school. There is a track marked on sheet 30 at L737944 L L and this seemed like the obivous route. The track is more of a bog road used by locals as a means to cut and haul turf but it provided excellent access to the foothills of Corruan Hill. At the top of the track there is a branch to the left and one to the right. We took the branch to the left which peters out very quickly into a small area of active cut bog. Navigation is very straight forward and a bearing was taken to the summit of Corruan. The going was very firm under foot but steep in places. Great views on offer in almost every direction. It wasnt long before we reached the trig pillar. Views all across Corruan and indeed Achill itself open up. Almost immediately the abundance of Loughs to the north side of Corruan appear. Without even realising you are drawn closer to them and before long find yourself leaving Corruan and heading in the general direction of SH 421. 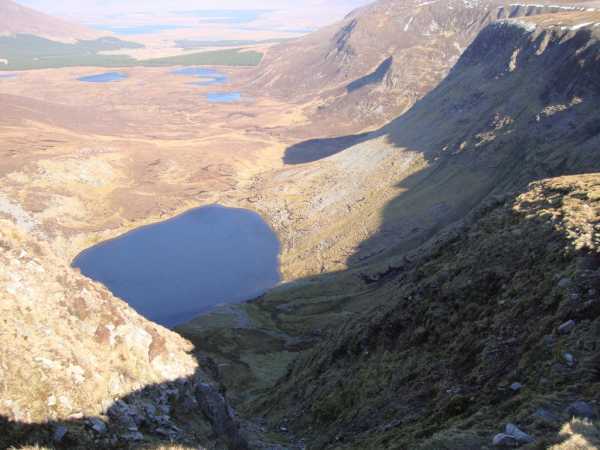 On route the spectacular corrie lake of Knockacorraun comes into view. A siren drawing you ever closer. There has never been a more obvious choice of lunch spot!